Nadica and Igor Stancev work as professional fly tiers, tying instructors, photographers and authors. They live in Skopje, Macedonia. They have collaborated in producing 9 books about fly tying which have been published in France (3), Norway (3) UK (1) USA (1) & Italy (1) providing photographs and details of how to tie flies and the materials used. They are negotiating publication of a new book of their own in the UK. 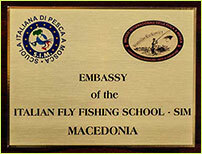 As well as competing and demonstrating in competitions and at fly fairs they are members of the Jury at the World Tuscany Open Fly tying competition and German Open Fly tying Championships.